Soul de Cuba is one of those places that I went into with moderately high expectations. 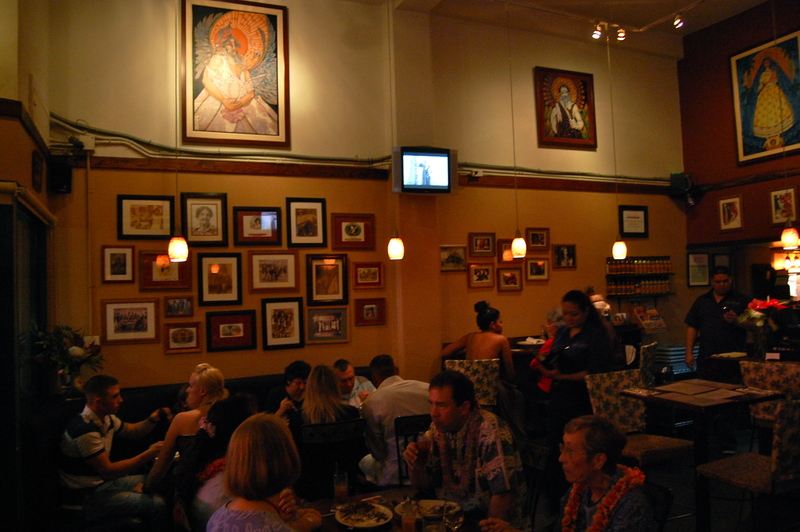 Honolulu’s premier – and perhaps only – Cuban restaurant, its location on the edge of Chinatown directly across from the Hawaii Theatre, and reputation place it within the sphere of established downtown eateries worth knowing. I have never been to Cuba, and am no expert on Cuban food. But if Soul de Cuba is a representative slice of the culture’s cuisine, then my imaginary romance with the flavors of the Caribbean may well be over. The interior is funky enough: high ceilings lined with paintings reminiscent of old Santana album covers, subdued lighting. We ordered what seemed an obligatory pitcher of Mojitos. Warning signs from the first sip, the flavor of Mojito mix. 39 Hotel sets the standard for Mojitos in this town, and this was a far cry from their blend fresh ingredients – in fact, we later stopped by there to make sure our taste buds did not deceive. The platter of appetizers (Soul Sampler) was somewhat flavorful, but heavy, and not at all outstanding. If the appetizers were passable, the main dish was disappointing. I thought I couldn’t go wrong ordering the Pollo Soul de Cuba, the alleged most popular dish on the menu. Unfortunately it was just incredibly bland, with the mango-based salsa providing the barest modicum of flavor. Somehow bland and Cuba just don’t seem compatible in my mind. The dish my wife ordered, Camarones con Salsa, had more zesty zing to it, which only deepened my chagrin. Final verdict: embargo against Soul de Cuba.